America and its allies make modern war in a way that assures “mistakes” destroy hospitals, and civilian lives are taken by drones. These horrors are all too often strategic decisions, or the result of the profligate use of needlessly destructive weapons. They are typically far from accidents. The destruction of a hospital in Kunduz, Afghanistan, including the deaths of physicians from Doctors Without Borders, has become the celebrity example of America’s conduct of war. It is the one that made the news, much like a single child dead on the beach stood in for five years of unabated refugee flows out of the Middle East. But Kunduz is more important than just a dramatic news story, in that it stands as a clear example of a sordid policy. After a series of cascading explanations, the United States settled on blaming the Afghan military for demanding a strike on the building which was the hospital. There is truth in that — the request likely did initiate with the Afghans — but it ignores the larger story of how “accidents” really happen. The strike was conducted by an American AC-130, a flying gunship. A retired Air Force Special Operations officer explained to me that the AC-130 is considered a “first hit” weapon; its ordnance hits where it is designated to hit on the first try. The targeted hospital was marked by a U.S. Special Forces operator alongside the Afghans, using a laser. The AC-130 fired on the hospital for over one hour, in 15 minute paced barrages. How could the U.S. have known the target was a hospital? Easily. Kunduz had been controlled by the Afghans alongside their embedded Americans for some time. It was a mature battlefield, with landmarks such as the hospital well-known on the ground. In addition, NGOs employ organizations such as The International NGO Safety and Security Association (INSSA) specifically to coordinate with armed forces working around their sites, to include providing precise GPS coordinates to avoid “accidental” targeting. Doctors Without Borders also directly provides combatants their locations; in Kunduz, as recently as September 29. The latter details are especially important in evaluating strikes against hospitals and other civilian targets. Unlike in WWII when thousands of planes flew over cities hoping to hit a target only as precisely defined as “Tokyo,” modern ordnance is delivered by computer, using laser designation, satellite coordination, GPS systems and classified mapping tools. America blew up exactly what it aimed at in Kunduz. 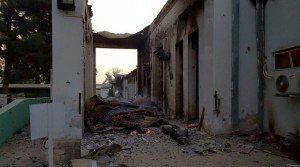 Kunduz was not America’s first hospital. The U.S. bombed a maternity hospital in Baghdad in 2003, a hospital in Rutbah, and stormed a hospital in Nasiriya. Shells hit the large Al Yarmuk Hospital in Baghdad. A hospital in Belgrade, former Yugoslavia, was bombed in the 1990s. In Hanoi, the United States struck the Bach Mai hospital — twice — during the 1972 “Christmas Bombing.” The United States also destroyed the Chinese Embassy in Belgrade in 1999, citing inaccurate maps as the cause. There are always investigations following such incidents, though in the history of modern American warfare none have ever been deemed such strikes as having been planned. Hospitals make attractive targets. Destroying them results in fighters dying of their wounds, and increases the burden on healthy soldiers, pulling them from the battlefield to care for their own wounded. In military terms that is known as a “soft kill.” Accidents emerge in war, but so do patterns. The killing of civilians as a result of American war is not limited to attacks on hospitals. The global drone war continues to take innocent lives, in what has come to be known without shame or irony as collateral damage. In Yemen, in just one example, American drone strikes aimed at 17 named men actually killed 273 people, at least seven of them children, including the American Citizen son of alleged al Qaeda propagandist Anwar al-Awlaki. But the killing of civilians as a result of American war is not limited to attacks on hospitals, or by drone. There is a commonality to the growing death count created by America and its allies: the inevitable civilian deaths caused by the profligate use of horrifically destructive weapons, especially inside urban areas. Civilian casualties overall in America’s 2003-2011 Iraq War were anywhere from 140,000 dead to upwards of 500,000, many by artillery, cluster munitions, and depleted uranium munitions, indiscriminate weapons unique to American forces. For its drone strikes, the U.S. uses Hellfire missiles, armed with warheads originally designed to burn through the heaviest tank armor. Aiming them at a person inevitably will kill others nearby; the U.S. claimed al-Awlaki’s son was killed inside a car, seated next to the actual target. Such deaths are also closely tied to America’s policy of “signature drone strikes,” where a missile is aimed at a “profile:” a suspect cell phone, a car matching some description, a suspicious gathering outside a home. America’s allies, equipped with American weapons, follow a similar pattern in their making of war. The U.S. throughout the Middle and Near East, the Saudis in Yemen and Israel in Gaza, employ cluster munitions in urban areas. Such munitions are known as “area denial weapons,” which cause massive, indiscriminate destruction over wide swaths of territory. Documented inside Yemen have been American-made CBU-52 cluster bombs, each loaded with 220 “anti-material” bomblets. Imagine the use of such weapons inside central London, or on a Manhattan street. Though not confined to cluster munitions alone, the deployment of U.S.-made weapons by the Saudis in Yemen has only added to the carnage. Almost 4,000 people have been killed, with 19,000 injured and more than a million displaced from their homes. In Gaza in 2009, the Israelis used cluster munitions, white phosphorus (a burning agent also used by the U.S. in Iraq), as well as standard artillery, rockets and airstrikes, all against dense urban areas. The UN estimates over 1,400 civilians, of whom 495 were children, were killed in the attacks. The Israelis also destroyed a hospital in Gaza, attacked two others, and shelled UN-run schools in 2014. The U.S., Israel and Saudi Arabia are among the countries that have refused to sign The Convention on Cluster Munitions, a treaty banning the use of such weapons. Accountability remains in the hands of those with the weapons. America and Israel conduct self-investigations, and stymie independent ones, to clear their military of blame (the Saudi do not even appear to bother.) At the UN, the United States blocks action critical of Israel. In Yemen, the U.S. claims it cannot control how the Saudis choose to employ American weapons, and has stated the Saudi actions only “border on” violations of international law. NATO and the EU are deathly silent on the substantive issues, even in places where their own forces are on the ground. It is clear that modern war as conducted by the United States and its allies in the Middle East has as a known outcome massive civilian casualties. The sites purposefully targeted can be civilian when needed, in violation of all known standards of international law. The steady flow of “accidents” and collateral kills are fully-expected, inevitable and foreseeable consequences of the choice of weapons used. The civilian deaths are not accidental, but policy. Kunduz was no accident. It was simply another example.